Despite a lifetime of training, the author--who was recently honored for his dedication to passing on knowledge to others--continues his search for insights into shooting and gunfighting. When I entered law enforcement, I was certainly a gun enthusiast, but being interested in guns does not necessarily mean that you can shoot them well. 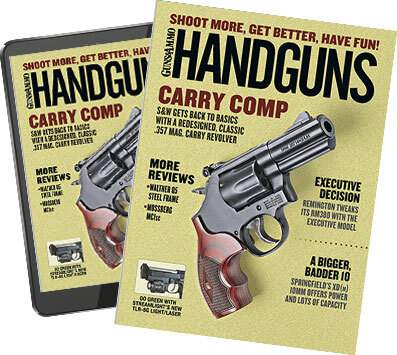 As my interest grew, I began to read as many of the gun magazines as I could, and as I gained both street experience and spoke with those who had prevailed in armed conflict, the articles made greater sense. In 1980, my agency founded a SWAT team, and I went to the state training academy to become a firearms instructor. I found out that I was not a good shooter, and I resolved to correct this. I embarked on a lifetime of training--both of myself and of others--that recently culminated in being honored as the 2010 Law Enforcement Trainer of the Year by the International Association of Law Enforcement Educators and Trainers Association, the world's largest police training association. My first firearms training experience in this quest was around 1983 when I was invited by Bert DuVerney (who would later become the director of the Smith & Wesson Academy) to attend a course taught by John Farnam. It cost $110. We had a mortgage, car payment and small children, so this was big money, but I knew I had to attend. My wife and I scraped together the money, and I headed out to my first firearms training course beyond the state academy. I could not believe how much I did not know about pistol shooting. John's instruction in the fundamentals changed everything for me. One night we stood under an overhang while it poured rain and he discussed the whole "stopping power" debate. He spent several hours with me, and I will never forget it. I later became the president of the Ohio Tactical Officer's Association and suggested that Evan Marshal be a guest speaker at our annual conference. I called him out of the blue, and he agreed to come. His take on stopping power was controversial at the time, but what he said rang true to me. While some claim that his database of shootings is made up, I can assure you that it is not. I have both seen it and contributed to it. I took his idea and over the years have built a database of my own after a disastrous failure by a deputy in my agency when using the 147-grain sub-sonic 9mm that was all the rage at the time. What I have found seems to mirror Evan's data. In a nutshell, handgun-stopping power is hard to accurately measure or predict. By shooting ballistic gelatin you can prove that a bigger bullet is a better bullet in that it creates a larger wound cavity.